• Forecasts in the future will become more and more probabilistic in nature and ensemble based due to the ability of computing power, however, accurate 14 day forecasts of rainfall are about 3 years away. • A farmer needs to consider their level of risk for the work they are doing i.e. would you change a decision at 50% or at 75% probability. • Seasonal forecasts have variable skill (accuracy) month to month. Consequently risk levels change month to month. Interpreting daily forecasts are not what they appear to be as can be seen in the diagram below. Possible rainfall is given as a range, and in this example it is 1 to 5mm. The first number in the range (1mm) has a 50% chance of getting at least that amount. The second number (5mm) has only a 25% chance of getting at least that amount. 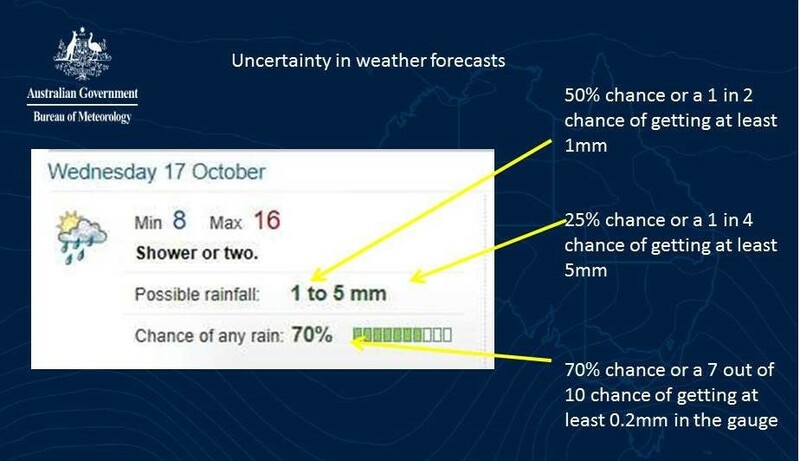 The chance of any rain refers to the chance of getting at least 0.2mm in the gauge. The BOM are currently reviewing the climate and weather tools they currently support or plan to develop. Forward your feedback onto Vernon Carr – Agriculture Program, email vernon.carr@bom.gov.au or the Agriculture team at agriculture@bom.gov.au on any feedback on specific climate or weather data requirements you have, including:What information or tools you are currently using with your business or with your clients? What additional data, information or tools you require? Vic DPI have a number of moisture probes installed throughout Victoria as well as predicted soil moisture availability maps modelled on vegetative growth and rainfall. The spray fallows where meters are installed are recording much more available moisture than the soil moisture maps which demonstrates the value of moisture meters to get a more accurate indicator of soil moisture . Alternatively you should auger your paddocks to get an indication of available moisture to assess your risk when sowing winter crops this year as there is differences depending on management of the paddock over the summer. · El Nino doesn’t equal drought as 75% of El Nino events have still provided enough in crop rainfall to realise a harvest from winter crops. · At this stage of the year you should plan for anything as the forecasts for April are classed as “unskilled”- or lower accuracy than other months of the year. • There is now a dependence on allocation trade to support irrigation enterprises. • Farmers appear to be increasingly using alternative financial structures to hold water shares not tied to land to provide flexibility. • The reduction of the size of the consumptive pool and changing irrigation demand across the basin will influence future market prices for water share and allocation. • Dairy in the GMID is less reliant on perennial pastures, shifting to more spring and autumn irrigation and dynamic in nature to adapt to the changing water market, climate and commodity market conditions. • The increased demand for water for horticulture across the connected southern Murray-Darling Basin may lead to insufficient water during future severe droughts to meet the needs of all. • Water availability in NSW has been seen to have a very strong influence on market prices.